New Delhi, March 25: Delhi Capitals star Rishabh Pant might have played a stellar role on Sunday to win them the opening game against Mumbai Indians at the Wankhede Stadium, but Chennai Super Kings coach Stephen Fleming made it clear that overplanning keeping one player in mind wouldn't help the team. "You have to respect so many players in the tournament and he is one of them. But there are others as well. Have to be sure you don't overplan. He is one of the great young prospects in Indian cricket. But there is Shikhar Dhawan, Colin Ingram, captain Shreyas Iyer. One thing is to find a weakness, but have to use it well. You must focus on own strength," he explained. Asked if the conditions in Feroz shah Kotla will help the Chennai side as CSK too banks on spin on their home ground in Chepauk, Fleming said: "The last game was difficult for the batters. The bowlers excelled. The fact that we use spinners is one or our tactics, we have seaming bowlers as well to exploit situations. We will spend time to look at the conditions. Getting the combination right is important." LIVE KXIP 144/3 in 15.5 Overs| RR vs KXIP, Live Cricket Score of IPL 2019 Match: Chris Gayle Departs on 79. While everyone has spoken about how M.S. Dhoni is in the last stretch of his career, Fleming said he didn't wish to get into the debate and he primarily wanted to see MS at the 2019 World Cup. "I certainly was hoping he gets through to the World Cup and that he will. Haven't had discussions about what happens after that. I would want him to carry on for CSK till the end of this cycle. He is training well, playing well and enjoying himself. That is important," the coach said. MI vs DC IPL 2019 Stat Highlights: Rishabh Pant Stars in Delhi Capitals' Impressive Win. 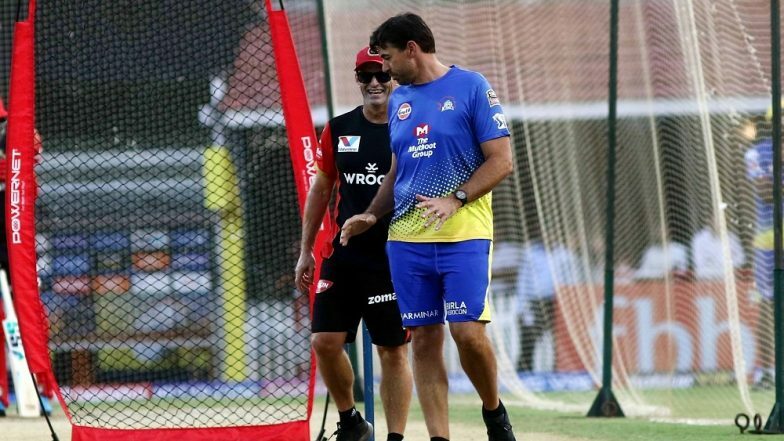 Fleming was all praise for senior spinner Harbhajan Singh and said that the off-spinner will definitely be considered for the game against DC. "He was fantastic in the first game. Experience is important. There are a lot of left-handers in the Delhi side. That was discussed in the RCB game as well. We will look to consider that. It is about the skill sets we have. It was a compliment to not having to stick to the overseas quota. We will consider it again tomorrow," he said. While Ambati Rayudu is playing the IPL, he definitely has his sights on the no.4 spot in India's World Cup team. But Fleming said that the CSK opener should look to play freely. "He doesn't have to be conservative with us. Loved him running down the wicket and hitting the fast bowler over the top (against RCB) and that is what we want to see," he said.